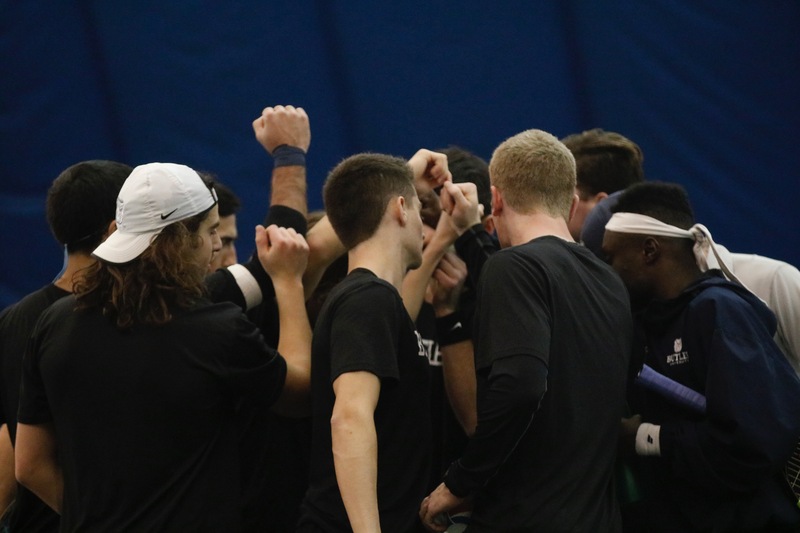 The Butler men’s tennis team huddles up before a match. Butler is now 1-2 in Big East play. Collegian file photo. The Butler University men’s tennis team went 0-2 over the weekend, falling to Marquette and DePaul. The Bulldogs were swept 7-0 by Marquette on April 13. Butler’s only victory of the match came from the doubles tandem of Aviv Ben Shabat and Mason Dragos, who won 6-3 in the No. 1 doubles spot. The victory was rendered meaningless, however, by Marquette’s victories in both the No. 2 and No. 3 doubles spots to take the doubles point. Butler, the lost all five singles matchups. The Bulldogs lost in the No. 4, No. 5, and No. 6 spots in straight sets. In these defeats, only Spencer Lang was able to amass more than four points, losing 6-4 and 6-2 in the two sets. With four points, Marquette had already secured a victory, but Butler forced the remaining three singles matchups to three sets. Ultimately, none of those led to a point, and Butler lost 7-0. In a closer match, Butler lost 4-3 to DePaul on April 14. Butler took the doubles point this time with victories in the No. 1 and No. 3 spots. Both Ben Shabat and Adrian Mag parlayed their respective doubles victories into singles success. Butler losses from Ari Gerstein, Michael Dickson, and Mason Dragos tied the match at three. The No. 4 spot matchup between DePaul’s Christopher Casati and Lang would decide the match. After splitting the first two sets, Lang would surrender the third set by a score of 6-4, ending Butler’s weekend without a win. The Bulldogs now stand at 13-6 and drop to 1-2 in Big East conference play. Butler will face Xavier on April 21 at home, where they are undefeated. The match will be their last before the Big East Tournament.